This Fat Tuesday Don't Miss a Chance to Celebrate! Enjoy boiled crawfish for just $3.99/lb tax included! Head to Avondale Brewing Co. and get your fill! Prices good for Fat Tuesday only, so don't miss out! Celebrate Fat Tuesday with some of the best food in town! Danny is preparing a full menu; shrimp étouffée, gumbo, red beans and rice, crawfish pie, and of course King Cake. They will start serving lunch specials at 11am and they can't wait to see you! Click here for more info. It's #MardiGras, baby! Let the good times roll and enjoy live New Orleans Jazz, Funk and Soul with Matthew DeVine starting at 6pm, Hurricanes, Abita beer, Gumbo and Jambalaya! Click here for more info. Fat Tuesday Crawfish Boil!! 2 Pounds of Crawfish + Corn & Potatoes - $15. 1/2 Off Draft, $5 Pints of Mimosas & Bloody Marys, and $7 Hurricanes! Click here for more info. Fat Tuesday at "the FREE"
Be sure to #headtothefree and LET THE GOOD TIMES ROLL!!! It's FAT TUESDAY at Innisfree with $5 Hand Grenades and $5 Hurricanes plus live music with BILLY GANT and his All Star Brass Band! Plus BEADS, BEADS, BEADS! Click here for more info. Enjoy the 3rd Annual Fat Tuesday Pancake Dinner, benefiting the Magic City Acceptance Center! 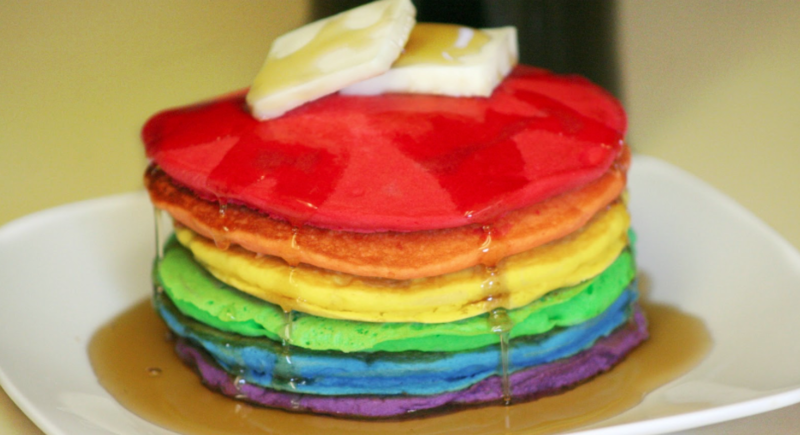 They're serving up everyone's favorite RAINBOW pancake recipe this year, along with a toppings bar, sausage, orange juice, and Starbucks coffee for just $10! Mimosas will also be available for a suggested donation of $2! Stop in or get your pancakes to go, but don't miss out! Click here for more info. Join BMR for Mardi Gras at The J. Clyde to benefit Children's of Alabama . There will be cajun food specials and drink specials from Fairhope Brewing Company, including the new Moon Pie Stout and Lil' Poison Brown Ale. There will also be live music from Tragic City, Psychic - Miss Ericka will be doing readings, and we will be giving away a pair of passes to The Hangout Beach Music and Arts Festival! Click here for more info. Tin Roof is bringing you $5 Hurricanes, free King Cake, & live music from the Brass Monkeys! This should be a fun time for all! Click here for more info. As Birmingham's only NOLA-based bar, Zydeco will host its annual Fat Tuesday celebration! Doors open at 5pm. They will have free beads and king cake all night long to go along with the best drink specials and music by CBDB. Click here for more info. Pho food and fun! Join us late at Marty's on Fat Tuesday for a funk filled night with Tragic City. You'll be able to get some great food while taking in the great music! Click here for more info.